The $39.99 oil/filter change and tire rotation special sounded too good to be true. It was! After a recent oil/filter change at Community Toyota, Baytown, I rechecked the engine oil level and it was about one (1) inch above the "Full" mark. The oil was removed and measured, it was indeed well above the proper level. Also the "new" oil was very dark and smelly. The Community Toyota service manager said it would not hurt the engine to overfill it and was very discourteous. 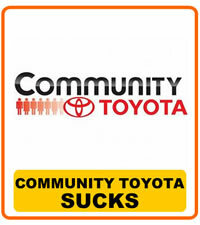 I wonder how many unsuspecting Community Toyota customers, women, retired seniors, have to rely on these bozos to provide the proper level of service they pay this dealer to perform and receive this treatment in return.